BBC Top Gear Vietnam special show in 2008 is a great show about the funny motorbike trip in Vietnam from South to North Vietnam. This Top Gear Vietnam motorcycle tour from Ho Chi Minh city to Ha Long bay in Northern Vietnam displays more than the things you did see on the show. After the 23 day riding motorbikes on the touring road of nearly 3000 km with the experienced team of Vietnam Motorbike Tour Expert you will surely know what the real Vietnam look like but you will find it difficult to describe how beautiful it is. Cat Tien National park is one of biggest and most famous ones in Vietnam. This 720 km2 rain forest used to be famous for rhino and many other animals in danger. At present rhinoes and some of them are gone due to illegal hunting but the Cat Tien National park is still great destination for the nature lover and for the one who would like to be quiet away from the bustle Ho Chi Minh city. The first day ride from Ho Chi Minh city to the National park of Cat Tien is the perfect start of this Vietnam motorcycle tour top gear. After a short day ride out of busy city, we’ll have a peaceful time at the park in the middle of the green nature. Stay in a guest house. After saying good bye to the peaceful Cat Tien National park, we’ll keep motorcycle touring up to North on the winding mountain passes to Da Lat, we’ll have plenty of tops for picturing of the beautiful mountain view and waterfalls. Besides, we can also have some visits to peaceful villages of the ethnic people along the way. It’s quite long motorbike ride today but it’s an enjoyable motorbike tour to Da Lat. Stay in a hotel. This motorcycle tour to Nha Trang offers some great motorbike ride on beautiful coastlines and amazing sea view that you can see on the BBC’ Top Gear Vietnam special show in 2008. 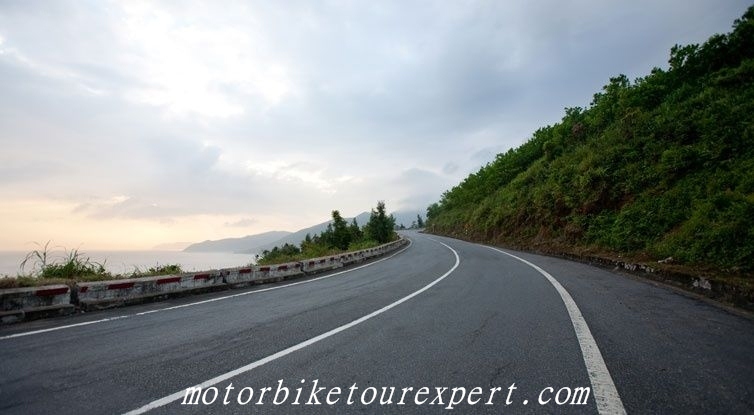 The tour also provide a great motorcycle ride on winding mountain passes in Central highlands with scenic view that you can have plenty of stop for picturing. Today’s ride is surely the highlight of this Vietnam Motorbike tour Top Gear. We’ll be in Nha Trang at around 4:30, it’s good time to have beer at the beach or have swim at the white sandy beach of Nha Trang. Stay in a hotel nearby the sea. Nha Trang is a peaceful coastal city in which you can find hundreds of interesting activities for your holiday such as: spending time in clean sandy beach, taking a short boat trips to some quieter islands where you can do diving, snorkeling…One day is quite short to traveling around Nha Trang but for the bikers who doing the 23 day Vietnam motorcycle tour Top Gear is a great time to have rest and save energy for the next days motorbiking to North Vietnam. You can also doing a short ride via the beautiful coastlines nearby Nha Trang. Stay in a hotel in Nha Trang city. After getting on the bike, saying god bye to the coastal city of Nha Trang, we’ll continue the Vietnam motorbike tour up to Central highland province of Buon Ma Thuat. Before motorcycling up to the high mountain passes, we can enjoy some more motorbike touring on scenic coastal roads. In the afternoon, you’ll see a different beauty of landscape.The view of mountain is different from scenery you’ve seen on the days before: large and green coffee plantation, motorbiking cross by some rustic villages of the local hill tribes, more visits to the historical sites to learn more about the Vietnam war… We’ll end the Day 5 of this motorcycle tour in Vietnam at around 5:00 PM and stay overnight in one of the village of the local people. After saying good bye to the friendly host, getting on the bikes then keep North Vietnam motorbike touring up to Kon Tum. It’s a long motorcycle ride on Ho Chi Minh road with a lot of stops for interesting visits to historical sites, battle-fields…We’ll be in Kon Tum at around 5:00 PM, staying at the hotel. It’s another long day to ride motorcycle to lower land of Hoi An. We continue the Vietnam motorbike tour on Ho Chi Minh trail, the ride in the morning is up and down hill on the winding Ho Chi Minh road, crossing through some peaceful villages of the local hill tribes such as BaNa, Ede…After lunch in Kham Duc, heading all the way down to Hoi An, arrive in Hoi An in late after noon. Stay in a hotel in town. Hoi An is a great place to cheer up or have rest after a long motorcycle touring, you can find it here all the things one tourist need: great foods, friendly shopping ares, sandy beaches and a peaceful area…Just follow the Vietnam Motorbike Tour Expert’s guide to have an enjoyable walk around the town, have some visits to some typical traditional houses with big influence from Chinese, Japanese and western architecture, it’s interesting time to learn more about history and culture of the Hoi An town and the local people. Or you can also have a short motorbike ride around Hoi An to see some rural villages of the Viet people or to the peaceful beaches. Stay at hotel in Hoi An town. Saying good bye to Hoi An, we continue the Top Gear tour Vietnam up to Prao, after crossing through rice fields, bamboo bridges and visiting the Cham tower to learn more about the Vietnam history and the Charm culture. Then we’ll resume the Ho Chi Minh trail motorcycle tour to Prao, the ride is up and dowm passing through more hill tribes’ villages some waterfalls then we’ll be in Prao at around 4:30 PM. Stay overnight in a gest-house in town. 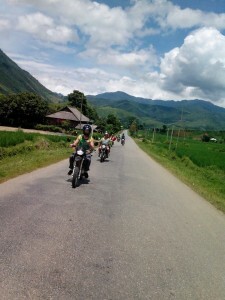 It’s one of the best motorbike rides of this long Vietnam motorbike tour, after leaving the Prao town, we’ll have an enjoyable motorbiking on the scenic Ho Chi Minh trail along the Dakrong river, the ride is on the smooth road offering amazing view of the river, mountain and the jungle. We’ll motorbike through some little waterfalls and some other villages of the hill tribe such as: Pa Co, Cotu…where you can have a quick visit to learn more about the interesting culture and daily life of the local. After crossing the beautiful Dakrong Bridge, we’ll ride straight to the Khe Sanh and before getting the hotel we’ll spend an hour visit to the famous Khe Sanh Combat base where you can see the remains, museum and learn how terrible the Vietnam war was. 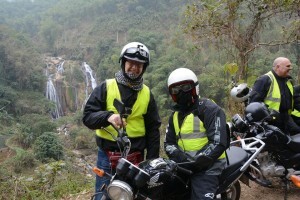 Continue the Vietnam motorbike tour Top Gear on Ho Chi Minh trail up to North Vietnam. It’s a long ride on the smooth road to Tan Ky, the motorbike ride in the morning still offers scenic views of the limestone mountain and the Phong Nha National park, in the afternoon, we’ll motorbiking crossing the the more populated areas with more villages and markets along the Ho Chi Minh trail and that offer a different view from the days before. 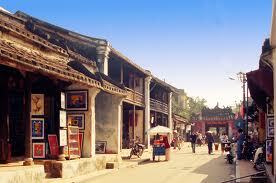 We’ll end the long day tour at the peaceful town of Tan Ky at 5:00 pm, stay in a little guest house named Volga hotel. Tan Ky is known as the starting point of the Ho Chi Minh trail where all the Northern Vietnam troops with weapons and food and together heading down to the DMZ in the Central Vietnam on the Ho Chi Minh trail in both Vietnam and Laos. 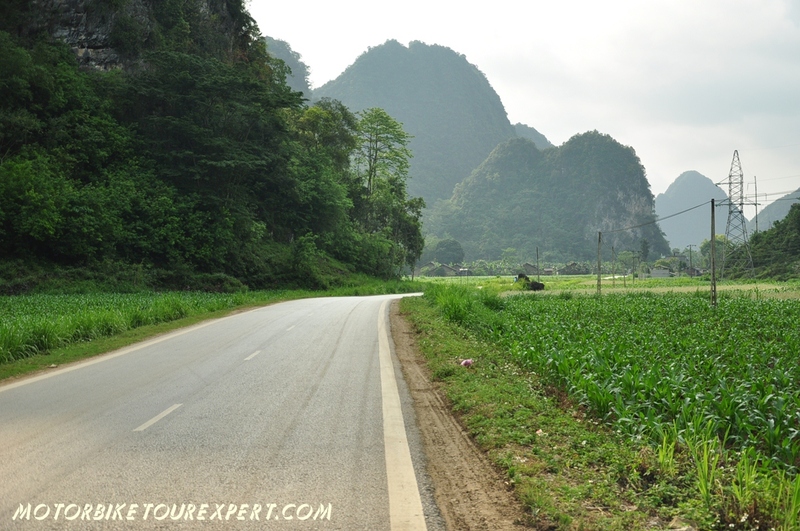 The motorcycle Tour to Hanoi today is almost on the new Ho Chi Minh road, the road is quite smooth with beautiful view of rice fields and mountains on two sides but it will get busier and busier when getting closer to Hanoi. We’ll end the long motorbike ride on Ho Chi Minh trail in Hanoi at around 5:00. Stay in hotel in the old quarter of Hanoi. Saying good bye to busy Hanoi, we’ll resume the Vietnam motorbike tour to Northern mountain areas. The first day for the North Vietnam tour from Hanoi is riding to the beautiful lake of Thac Ba. After around one hour riding motorbike, we’ll be in the countryside where you can see green and large rice fields with colorful villages of the Viet people. The ride is almost on the small roads along the rivers to avoid the busy traffic on the highways. 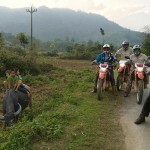 When getting closer to the Thac Ba Lake, we can have some short off-road motorbike rides. We’ll arrive at the Vu Linh village at about 3:30 pm, leaving the motorbikes with the local family then enjoy a beautiful boat tour on Thac Ba lake. Stay on the stilt houses with the friendly Dzao people. 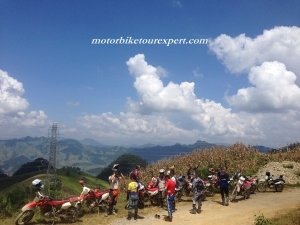 Start the Ha Giang motorbike tour at around 9 AM, we’ll ride motorbike along the Thac Ba lake bank that offer nice lake view and mountain view with some rustic villages of the Muong and Dzao people…Lunch is served by local food in a small restaurant in Luc Yen town. After lunch, we’ll keep motorbike touring on the back roads crossing more villages of the hill tribes and rice fields…we’ll be in Ha Giang city at around 4:30 pm. Check in the room in a hotel in city. 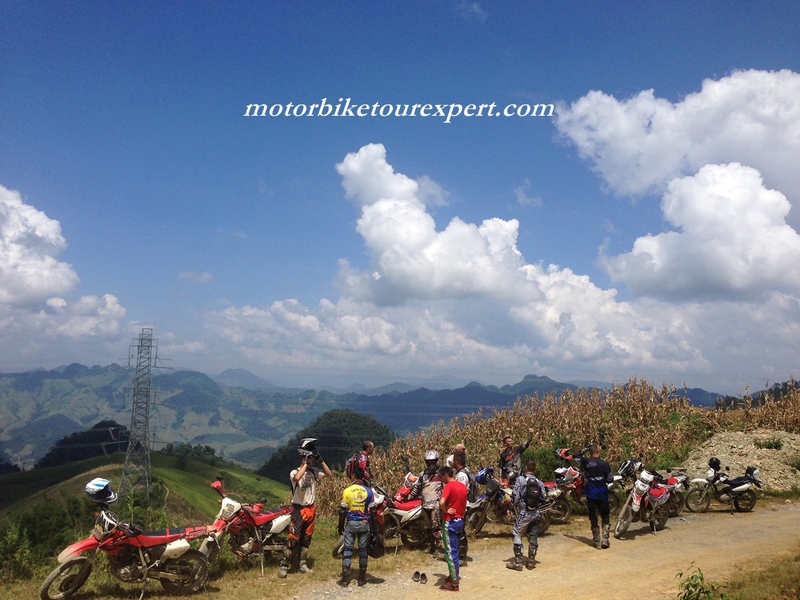 It’s one of the most beautiful riding days of this motorbike tour Vietnam. 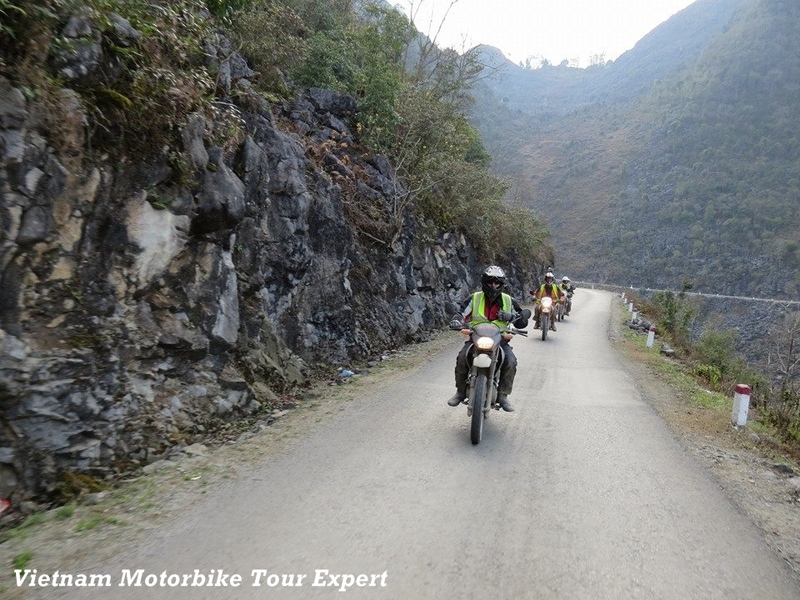 Ha Giang is a great place for motorbike touring in North Vietnam because of its beautiful natures and winding scenic roads. The motorbike ride from Hagiang to Meo Vac is only 170km but you’ll feel like a busy day with a lot of stops to take pictures and visiting to the local hill tribes. This motorbike ride is surely one of the highlights of the trip that can awake you after a long ride and encourage you to ride more. Stay at the hotel in Meo Vac. It’s quite a long but easy day riding motorbike on smooth back roads, mountain passes up and down hill, There will not be off-road rides today it will offer a lot of visits to the nice villages of the Tay, Dzao and Nung people. This Vietnam motorbike tour to Cao Bang end at around 5 PM in Cao Bang city, Cao Bang’s quite big city where you can easily find a local shop with cold beer, big market to shop the local things or go to Karaoke after dinner party. The Ban Gioc waterfall is one of the largest and most beautiful waterfalls in Vietnam. It’s located in between the Vietnamese and Chinese border in North Vietnam. Today’s Northern Vietnam motorbike ride to Ban Gioc waterfall is another highlight of the trip. It does not only offer a great visit to famous waterfall but the road to ride motorbike to the waterfall also offer a amazing view of natural beauty. We can ride to the waterfall on two different roads that offer some off-road or countryside roads with bamboo bridges. On any options of the road to Ban Gioc, you can see amazing view of mountain, natures between rustic villages of the local ethnic people who live mostly on the stilted-houses. Today’s motorbike ride is always one of the best parts of our North Vietnam motorbike tours. We’ll ride back to Cao Bang after visiting waterfall and stop to overnight at the little town of Quang Uyen we can choose to stay in a guesthouse or home stay. Keep motorbike riding down to the eastern part of Vietnam along the Chinese border. We’ll ride mostly on smooth roads crossing by some big border gate to China. We’ll have some interesting visits to historical sites to learn more about the French War or visits to famous temple or pagodas to discover the interesting culture of the Vietnamese people. Start the motorbike tour to Ha Long bay in early morning. 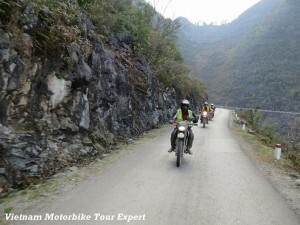 We still continue the the North Vietnam motorbike tour on the winding passes in the morning, the motorbike ride will get easier when we head down to lower and lower lands. In the afternoon, we’ll ride along the costal roads No 18 to Ha Long city, the traffic will be busier and busier when we get closer to Halong. We’ll be in the city at around 4:30 pm. Check in the room and stay in Halong city in a hotel. 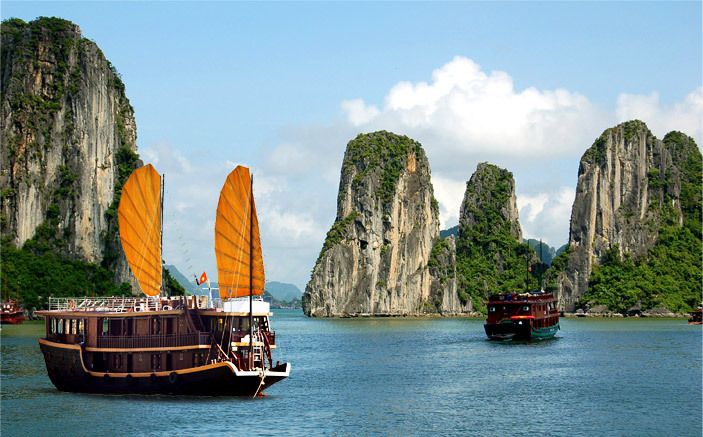 Having a free morning until 11:00 AM, we’ll pack every necessary thing for the 2 day tour on Halong bay by boat then take a taxi to the Tourist Boat Port. Right after departing, you’ll see another world with mysterical view of rocky mountain on the green water, just be lazy on the sun –desk, enjoying beer and relaxed, sea food meals will be served on the boat. This overnight boat tour is great to cheer up after the long motorbike touring in Vietnam. It’s wonderful chance to wake up early for the sunrise on the top of the boat or for a free Tai-Chi lesson on the rooftop or simply enjoy the completely refresh air from the sea. After breakfast on boat, we can do some activities such as: visiting the caves, swimming or kayaking more..then will get back inland at around 11:30 when your motorbikes are ready to ride you back to Hanoi. The short motorbike tour back to Hanoi is quite difficult because of no other choices but riding on the highway. We’ll plan to be back to Hanoi before 4 and end the great Vietnam motorbike tour Top Gear safely. Saying good bye to the team of Vietnam Motorbike Tour Expert and enjoy your free time in Hanoi. Please tell us the bikes you would like to ride on the tour and how many people in the group then we will give you the right price of the tour!